Ferrite which is oversaturated in carbon and is characterized by a lath-like shape. Lath ferrite frequently occurs in ADI (s. Bainitic cast iron, Austempered nodular graphite cast iron, Ausferritic cast iron). 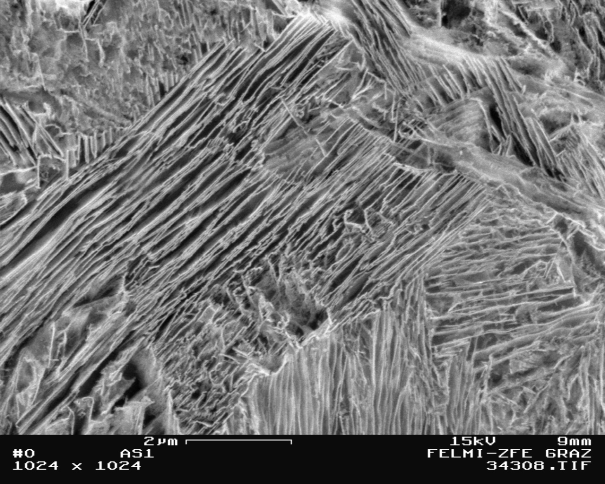 In this stable structure, areas with stabilized austenite are located between the lath ferrite which can contain up to 2% of carbon (Fig. 1). As the bainitic transformation temperature sinks, the thickness of the lath ferrite decreases.